A family day. Swimming at Holgates near Silverdale in the morning, Claire watching from the pool side, full of cold. We’d had our fancy coffee and lunch together. Now we were back home. It was still early. The consensus was to get the wood burner fired up, then watch the Charlie and the Chocolate Factory video again this afternoon. We’d all watched it together only yesterday. Spring sunlight and shadows highlighting the snowy mountain tops. I decided to skip the video re-run and nip out for a couple of hours or so. Enjoy this remarkable weather. 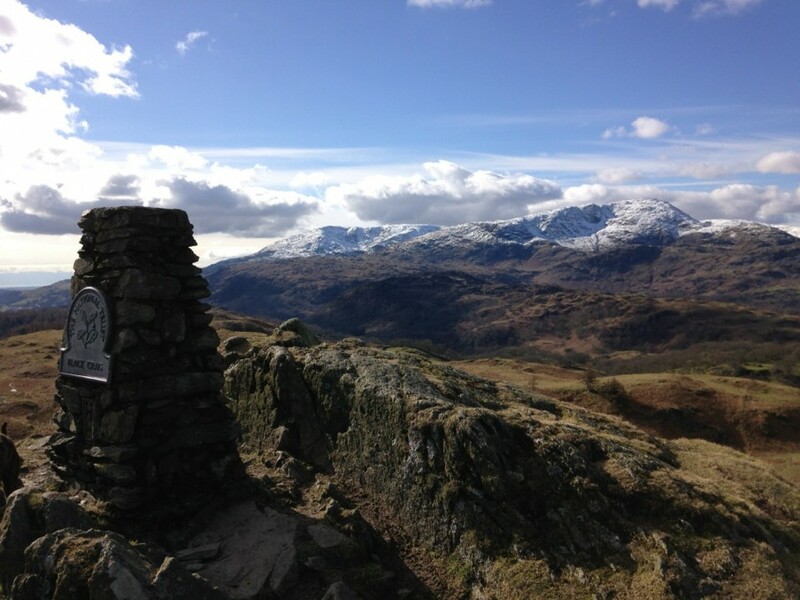 I changed into my running gear, put my bike in the back of the van, and drove towards Ambleside. 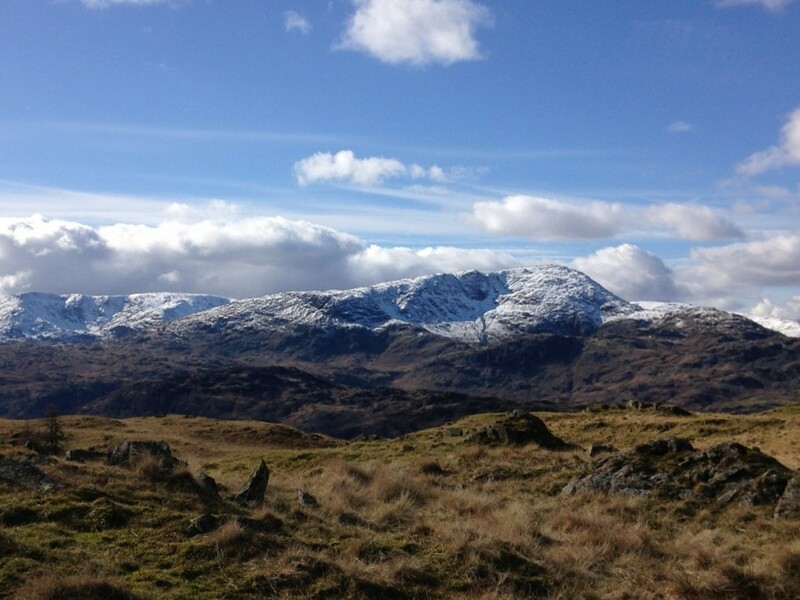 One of the great things about living in the Lakes is that everything is on your doorstep. Afternoons on a sunny weekend are a great time to head out into the honey pots. Most of the tourists are down off the hills, enjoying a well earned cream tea or a pint or two. I parked up in a little lay by on the back road to Red Bank, just beyond Loughrigg Tarn, jumped on my bike, and free wheeled down to Elterwater. Up the pot holed back road towards the Drunken Duck pub, leaving my bike behind a big stone wall, next to the start of the footpath up Black Fell. The trail first winds through lovely old oak trees, up into dark plantation conifers. 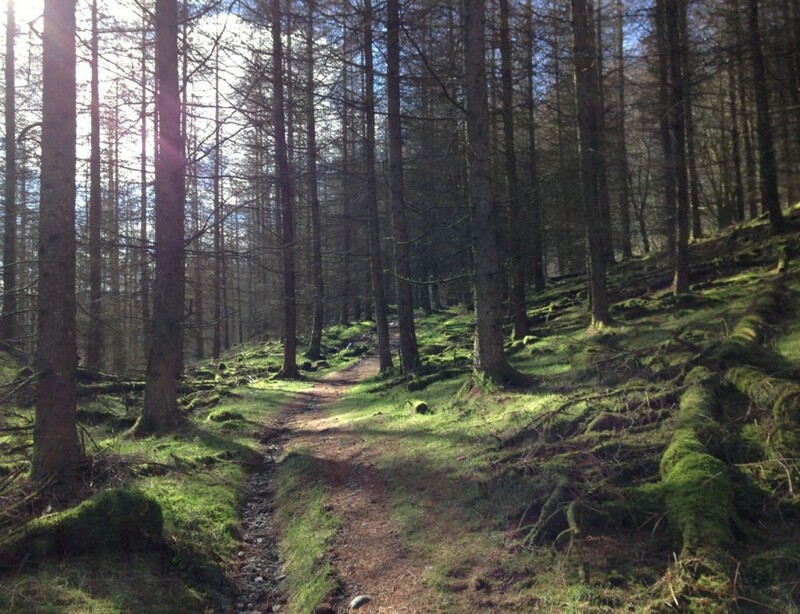 Then clubs a rough, rocky path, more like a stream bed, through open bracken, juniper and larch trees. 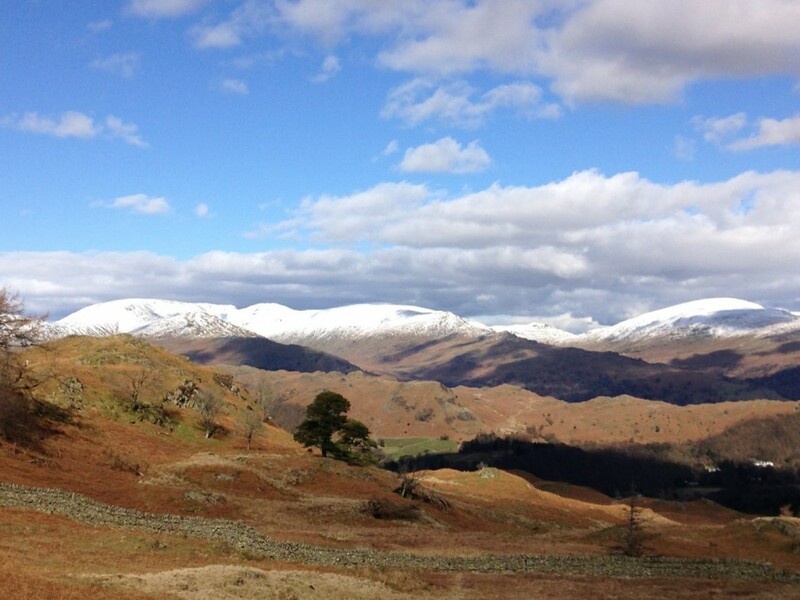 It’s one of the smallest of the Wainwrights. My son Ash climbed it when he was just four years old. Yet the views as you reach the summit are tremendous. On a day like today, I was lost for words. Taking photo after photo. Every direction was a perfect spring Lakeland scene, with snow capped summits, blue sky, fluffy cumulus clouds and pristine light. Within half an hour I was back at my bike, stepping on the pedals, climbing to the Drunken Duck pub. I counted seven personal registration plates amongst all the flash cars parked haphazardly on the verge outside. Memories flooded back. I first cycled this back road just after I’d moved to Kendal, when foot and mouth disease closed down all the footpaths. 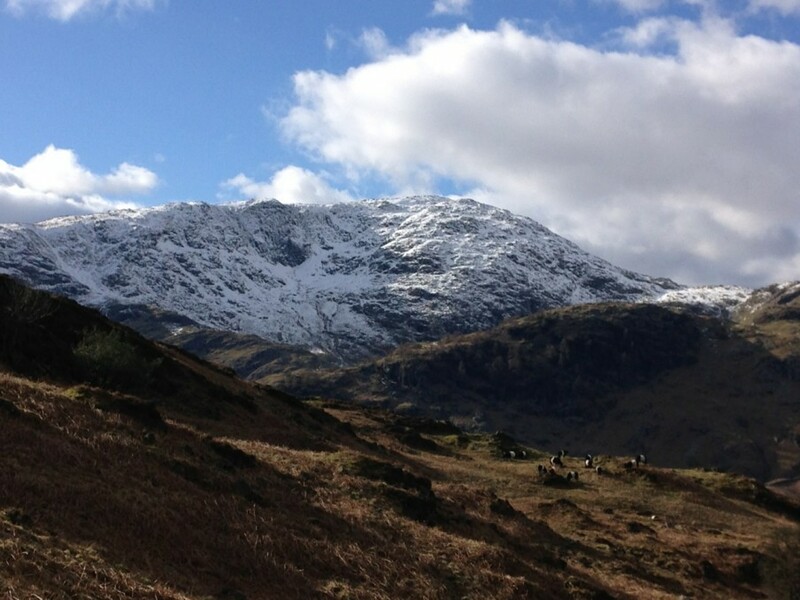 I’d recently joined Ambleside AC, and as we couldn’t run on the hills, we all simply got on our bikes instead. Great rides exploring these little known lanes that wind their way all over the Lake District. 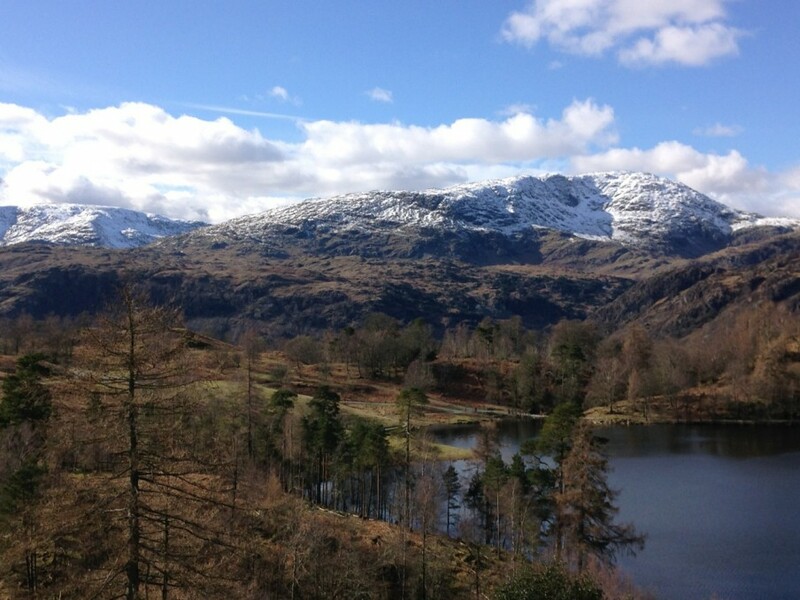 Today, I wanted to ride past Tarn Hows. I knew the views from there would be stunning. I left my bike near the disabled car park and jogged round to a favourite rocky ridge to take some photos. From Coniston village, I cycled along the main road back towards Ambleside, leaving my bike behind a wall at the far end of Yew Tree Tarn. 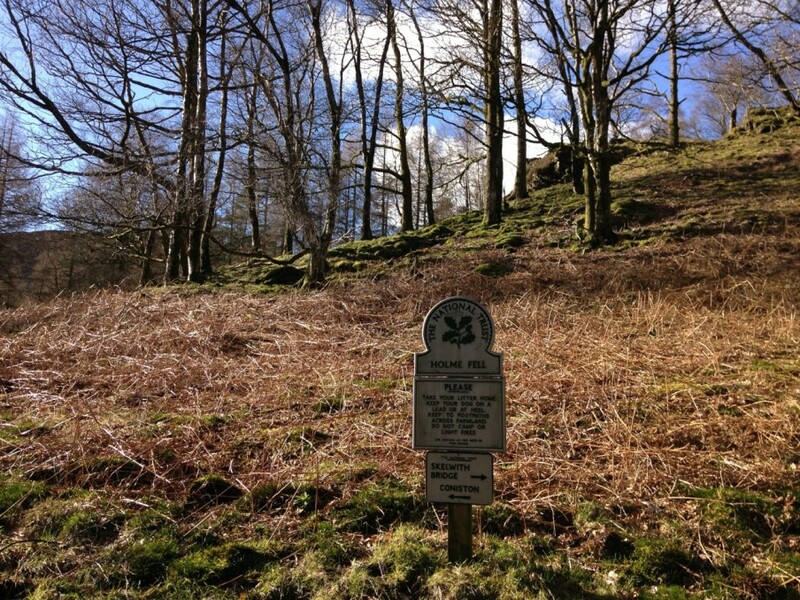 Another scenic woodland start to the climb of another “toddler” peak, Holme Fell, already ticked off by my son Ash. It took less than fifteen minutes to run to the summit, including all the stops for photos. The reward for such a small amount of effort? 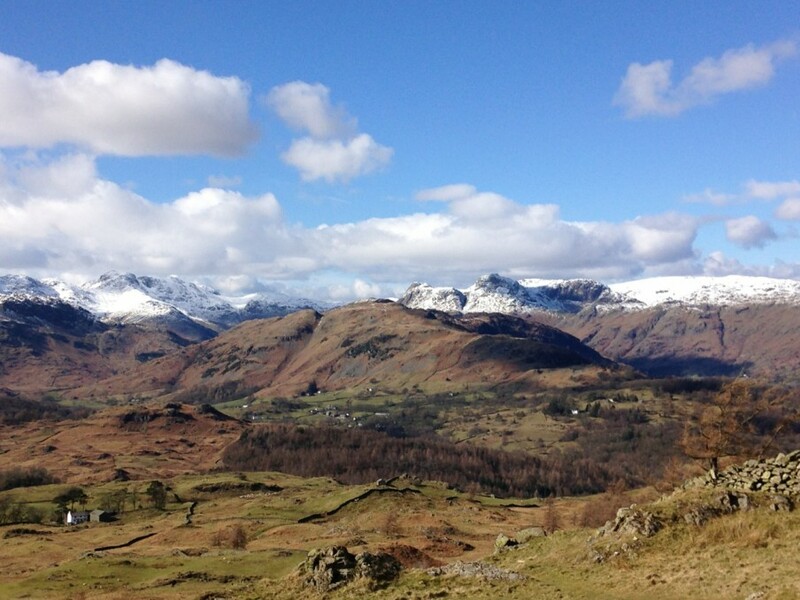 Views to rival anything in the Alps, with a backdrop of the Coniston and Langdale fells. Now it was late afternoon and if anything, the light was getting even better, the views totally inspiring. Full of energy from the amazing scenery I was soon making the final climb on the road to my van. I put the bike in the back, jogging up the road, before turning right. 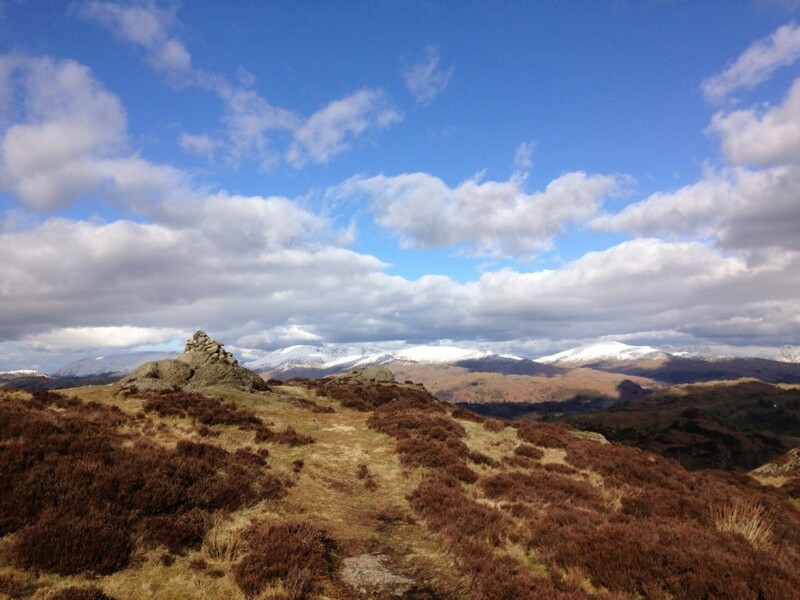 Up the steep path that follows the most direct line to the summit of Loughrigg. Half way up I stopped to look behind me. Everything was picture postcard perfect. I reached for my camera in my jacket pocket. It wasn’t there! I must have left it behind in my haste to get going. I thought about going back down to the van to get it, then decided the clouds were over developing, and the views at the top wouldn’t be up to much anyway. At the summit, the views were the most fabulous I’d ever seen. Ever. The clouds had subsided in the cooling air. Light was filtering through to all the peaks, picking out the contours. Lakes and tarns shining silver. They say the best photographs are the ones you never take, and this was one of those. A magical end to an afternoon that wasn’t planned. I jogged back down and drove home to Kendal for tea, stopping to pick some daffodils for Claire which were growing wild by the side of the road. 3 Wainwright summits today, that’s 63 down, 151 to go.